LINCOLN, Neb. (RNS) — In the days following major midwestern floods this spring, people of faith prayed for their neighbors and got busy lending a hand. They also turned to their beliefs to make sense of a disaster that washed away homes and roads, leaving more than a billion dollars of damage in its wake. For members of the Ponca Tribe of Nebraska, the floods came at a sacred time, when the Ponca people celebrate the arrival of spring and the new year with the first thunderclap. Some gathered quietly or said quick prayers of thanks to Wakonda, or God, that winter was ending and the earth was coming back to life, according to Dwight Howe, culture director for the Ponca Tribe of Nebraska. The Ponca Tribe of Nebraska is one of four federally recognized tribes with headquarters in the state of Nebraska, according to Howe. About a third of Ponca members live in Nebraska — many of them in service areas affected by the flooding. “It’s a holy time. It’s a powerful time. And this on top of it just sort of made it even almost supernatural,” he said. That sacredness was underscored last month when, not long after the first thunder of the season, heavy rains fell and snow melted across the Midwest. 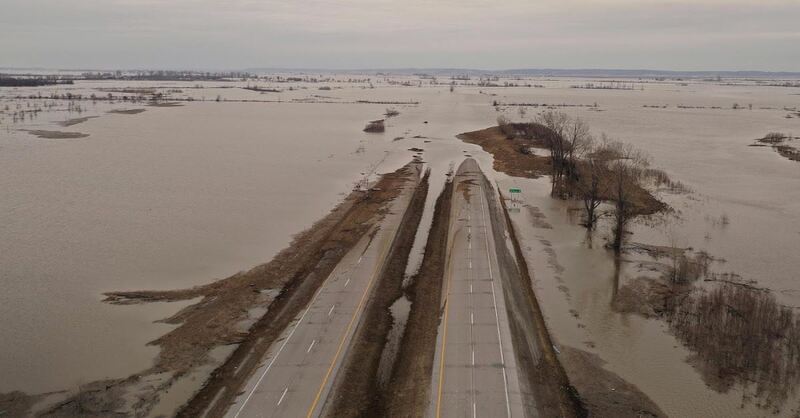 Something called a “bomb cyclone” struck and dams broke, washing away bridges and buildings and hurtling large ice chunks into farmers’ fields near Niobrara, Neb., the ancestral homeland of the Ponca Tribe of Nebraska. One day a road was there, he said. The next it was gone. “Only God can do that,” Howe said. The culture director acknowledged that the flood caused a great deal of damage. But he said he tried to see it as a blessing. Mark Mathewson, theologian-in-residence at Lincoln Berean Church in Lincoln, Neb., said he has focused more on how to respond to the floods than on why the floods occurred. Three-quarters of Nebraskans are Christian, almost evenly divided among evangelical Protestants, mainline Protestants and Catholics, according to the Pew Research Center’s most recent U.S. Religious Landscape Survey. Mathewson pointed to the biblical figure of Job, who lost everything he had in a series of disasters. Regardless of the reason God would allow such a disaster to happen, the theologian said, God calls Christians to respond, to help others and to “show them the love of Jesus” in the midst of it. That’s what Lincoln Berean is doing. The church is partnering with Samaritan’s Purse to clean out flood-damaged homes and remove debris in Fremont, Neb., a hard-hit area about 50 miles north of the city. The church’s splashy website features a link titled “Nebraska Flood Relief” on its homepage, advertising twice-weekly work days with the evangelical disaster relief organization, and Mathewson said it also has shared ways members can donate money to recovery efforts if they are unable to volunteer their time. Salih Rashki, president of the United Yezidi Community of America, was at a Washington, D.C., rally protesting the killing of Yazidi women in Syria when he heard about the flooding back home in Lincoln, where UYCA is based. People were evacuating their homes and leaving everything behind, Rashki said. That’s something to which Yazidis, a largely Kurdish-speaking religious group originally from northern Iraq, can relate. Many have fled as refugees from what the United Nations has confirmed is a genocide of the Yazidi people by the so-called Islamic State. “Whenever we needed help in Iraq, nobody gave us anything. Nobody helped us,” said Rashki, who said he came to the United States seven years ago and now is a U.S. citizen. He doesn’t want others to feel alone and isolated in their time of need. “Whenever people are in need, we are going to go help them,” he said. That’s part of who they are as Yazidis and part of their faith, according to Rashki. That faith is independent of any other religion and acknowledges both a supreme God and a deity called the Peacock Angel, said Zeyad Eesa, who manages communications for UYCA. Today, about 2,000 Yazidis call Nebraska home, making it the largest Yazidi community in the United States, he said. Eesa had been with Rashki in D.C. and began posting on Facebook when he got home, hoping to mobilize the community to do something to help flooding victims. UYCA doesn’t have an office, but it has a tent. So it set up a place over the weekend of March 22 to 24 to collect items for disaster relief efforts. Almost every Yazidi family in Lincoln filled that tent with diapers, baby formula, food, bottled water and other supplies, Eesa said. It took three pickup trucks and a U-Haul to take those donations to Fremont, where the Yazidi community also has sent teams of volunteers to help. “Together we are stronger. Together we can do something. We can make something better for Lincoln, for Nebraska — not just for the Yazidi community,” Rashki said. The Ponca Tribe of Nebraska also has responded to help flood victims. The devastation was humbling, a reminder to think of others who need help, according to Howe, the culture director. The Ponca people have always valued community and helping one another, he said, but they can’t just think of other Poncas, he said. “The same God that made me, made you. We’re all related,” he said. Howe said he has seen Ponca members and white farmers come together at the tribal headquarters in Niobrara to discuss how to move forward. Those farmers probably never had visited a tribal office before, he said. God brought them together, he said, and they have an opportunity now to build bridges — not just the physical bridges that washed away, but also bridges between people. Together, they talked about starting a phone tree in case of future disasters and about replanting trees lost in the flood. The Ponca Tribe of Nebraska has started collecting donations to help tribal members and has sent donations to help their neighbors in the Santee Sioux Nation. There are spiritual lessons to take from all that has happened, according to Howe. “Hardship can be an opportunity to grow spiritually,” he said. READ THIS STORY AT RELIGIONNEWS.COM. Article originally published by Religion News Service. Used with permission.